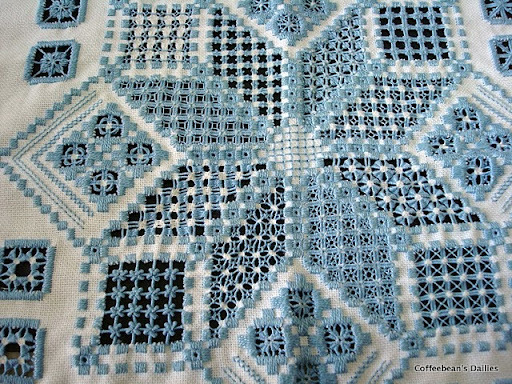 You should also check out her new in-progress hardanger project, which is very beautiful too. If you want links to free tutorials and hardanger design companies now that you’ve been inspired, check out my archive of hardanger posts. This entry was posted in Hardanger. Bookmark the permalink. There are some really very intricate filling stitches shown there. Great find! I just wanted to let you know that each time I receive your blog, I forget about the rest of the world! Time just goes so fast! but I was reading it for at least a couple of hours! ‘Love everything you share with all of us.thanks! Good morning – beautiful work in these photos. Thank you for posting them. I do wonder though, is it Hardanger? To me, it looks more like Punto Antico? The fillings are more complex than what is usually seen on Hardanger. Just wondering…. I put my response into a post, hope you find it helpful. Some of those stitches I’ve never even seen before! Really beautiful Hardanger, thank you for posting the pictures. Hannah and Ladies (commenters). Thank you! I have never heard of Punto Antico and look forward to reading up on it! It sounds Spanish? Punto means ‘point’ and Antico I’m not so sure, ‘old’ or ‘ancient’ or hmmm… I speak Spanish but will have to look it up. I so look forward to that! Thank you for finding me Hannah and contacting me. I have made a lot of progress on my Bargello project this past week but have to , yes HAVE TO put it down to work on a quilt for a deadline! Yikes! I LOVE Hardanger and I will go back and try to name those stitches! For those that visted my blog, thank you! Isn’t the WWW wonderful!!?? As an American living in the Middle East; it is great for me in many ways! I’m a little Homesick!!! Beautiful work 🙂 I love seeing advanced hardanger. I know of a book that instructs in most of those stitches. I believe it’s called A Collection of Beautiful Stitches and I know Nordic Needle used to carry it. Yep, it’s still there (http://www.nordicneedle.com/prod/3701A.html). I’ll have to check it out. Well, Google seems to indicate that it can be done. I don’t have a sewing machine and haven’t done machine embroidery, so I can’t evaluate which websites are worthwhile. But it looks like there may be patterns. OESD has machine embroidery designs with Hardanger. You really need embroidery software so you can move the small Hardanger designs around to form a larger design. I made a linen table runner with the designs and it turned out beautiful. County Fair. Would like to see more of you work.